Whether you’re an amateur or professional musician, you’re probably already aware that certain instruments will take up a lot of space. This is especially true if you’re starting to amass a collection. Ever think of making use of a storage unit to save space and keep them safe and secure? Storage units from Affordable Family Story are an ideal solution for professional musicians to store as many instruments as necessary in a modern and secure facility. In this blog, Affordable Family Storage offers some advice for storing guitars in a secure self-storage facility. As with most things you’re planning on putting into a storage unit, you should clean any and all guitars you’re storing beforehand. While it’s not necessarily essential, it’s always a good idea. Keeping them in storage long-term when they’re already damaged or dirty could lead to permanent staining or even bigger problems. Keeping the strings tight when a guitar is stored for a long period is going to damage them, costing you money in replacements later on. However, you also shouldn’t slacken them too much either. Generally, the ideal way to do this is to keep tension on the neck, but loosen them a half step or two. One of the biggest benefits of keeping multiple guitars in a storage unit is that you have a lot of space. This means you can organize them how you like. It also means you can store them properly. Standing up your guitars when they’re not in use is the best way to keep them in good condition. Not only is it a good idea to keep guitars upright whenever possible, you should also keep them in their cases. While a good storage unit will generally keep things clean, dust is pretty common, especially if you’re storing other items in there. Keeping clean guitars upright in their cases is the best way to keep them pristine. If any of your guitars are equipped with a vibrato arm, you should detach it before putting the guitar into storage. The only exception is the Bigsby type of vibrato, which can be folded into a specific rest on the guitar itself for storage. If you’re considering putting a guitar or multiple guitars into a storage facility, climate control is going to be an important factor. Exposing guitars to extreme temperatures, humidity, in particular, can be extremely bad for them. 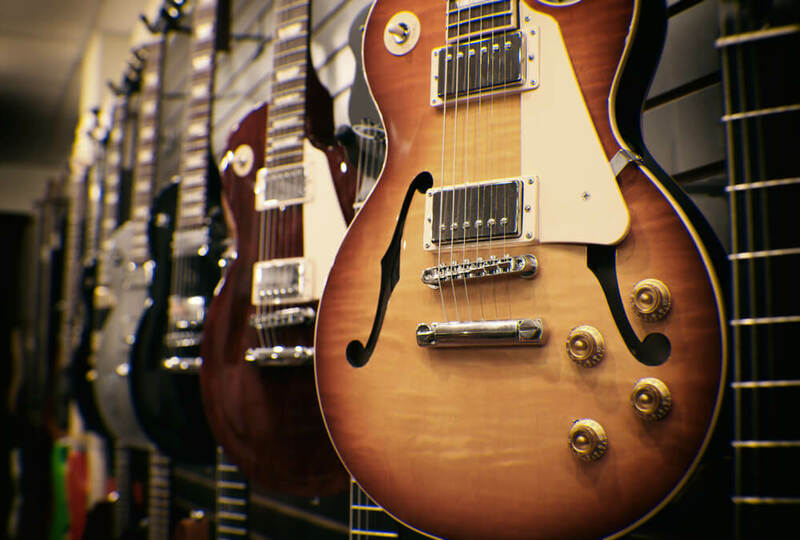 You need to be able to keep guitars and most other instruments in an optimal environment. Need somewhere to store your guitars? Or drum kits? Or recording equipment? Even if you’re not looking to store instruments, a storage unit can still offer excellent and convenient storage solutions. Our facilities in Omaha, NE and across the Midwest offer climate control, truck rental, online payment, and a wide selection of other features and options. Contact Affordable Family Storage about your storage rental today.